Web and mobile applications have become the primary customer touchpoint for financial services, payments, hospitality, travel and scores of other businesses. With the increased dependence on applications comes greater opportunity for attacks to expose customer data, sensitive IP, or a roadmap into an organization’s back-end infrastructure. In 2018 high-profile attacks hit major hotel chains, international airlines and banks, leaving companies in a tailspin to repair customer trust and brand damage. The top two attack methods for such breaches? Software vulnerabilities and web app attacks. What’s standing between many mobile apps and an epic breach? According to new research, about 8.5 minutes. A study conducted by global research and advisory firm Aite Group examined the protective capabilities of 30 different financial services applications found on the Google Play store. Using commonly available software tools, study author and Aite senior cybersecurity analyst Alissa Knight discovered nearly all of the apps could be easily reverse engineered – in less than nine minutes on average – exposing sensitive information such as personally identifiable information, account credentials, intellectual property, QA/test and production API urls, private certificates, and API keys/locations. Web and mobile applications have become the primary customer touchpoint for financial services, payments, hospitality, travel and scores of other businesses. With the increased dependence on applications comes greater opportunity for attacks to expose customer data, sensitive IP, or a roadmap into an organisation’s back-end infrastructure. In 2018 high-profile attacks hit major hotel chains, international airlines and banks, leaving companies in a tailspin to repair customer trust and brand damage. The top two attack methods for such breaches? Software vulnerabilities and web app attacks. Piracy, cheating, counterfeiting and other attacks can make or break a game economy. But common game security techniques have a reputation for slowing game performance, hurting user experience and being ineffectual. It puts the burden of security expertise on developers and often disrupts the software development lifecycle, slowing down time-to-market. But it doesn’t have to be this way. Think the attacks that breached two international air carriers’ applications can’t happen to your organisation? If you’re relying on network or device security solutions to protect your apps, you might want to think again. Web and mobile applications are among the most common weak points in an organisation’s security posture, and that includes financial services institutions. Traditional security measures like firewalls, WAFs or device solutions can’t defend web and mobile apps from reverse engineering or tampering. As connected medical devices become more commonplace, so do the threats of cyberattacks targeting applications that connect to these devices. Inadequately protected apps are vulnerable to reverse engineering and tampering, which can threaten patient safety, expose sensitive data, compromise valuable IP, and result in lost revenue, regulatory and governmental penalties. Traditional perimeter, network or device security methods are not sufficient to prevent these types of attacks. Join Arxan to learn how to defend your web and mobile apps, improve patient safety, protect IP, and help prevent data breaches. As connected cars become mainstream, the mobile applications that interact with them continue to evolve and add sophisticated functionality. This creates a growing security risk from vulnerable mobile apps that provide access to a wide range of critical vehicle functionality. Without intelligently protecting these mobile apps, connected car manufacturers and customers will become targets for cybercriminals looking to take advantage of this new and expanding market. -How to implement a robust application protection solution without disrupting the software development lifecycle. Think the attacks that breached two international air carriers’ applications can’t happen to your organization? If you’re relying on network or device security solutions to protect your apps, you might want to think again. Web and mobile applications are the most common weak point in an organization’s security posture, and that includes financial services institutions. Traditional security measures like firewalls, WAFs or device solutions can’t defend web and mobile apps from reverse engineering or tampering. Traditional network and app security approaches are no longer sufficient to protect high-value apps running in untrusted environments. Knowing the status of apps running in the wild and whether they are under attack is key to responding to the ever changing threat landscape. Visibility into when, how and from where an attack is happening, and the ability to optimize your response in real time can mean the difference between stopping a threat before it spreads or picking up the pieces after the fact. In part three of our application security series, we’ll share best practices for app protection and mitigation, plus how Arxan’s comprehensive app protection and alerting capabilities can help prevent reverse engineering, code tampering, IP theft, and help level the playing field with attackers. Everyone knows that high-value mobile applications like banking or payment apps can be the gateway to a treasure trove of sensitive information. What most organizations may not understand, however, is just how easy it is to reverse engineer applications after they’ve been deployed to an app store, using freely available tools. In part two of our application security series, Arxan Senior Security Architect Chris Stahly will demonstrate how easily an attacker can gain access to IP, customer data, and even encryption keys if a high-value app is not properly protected. 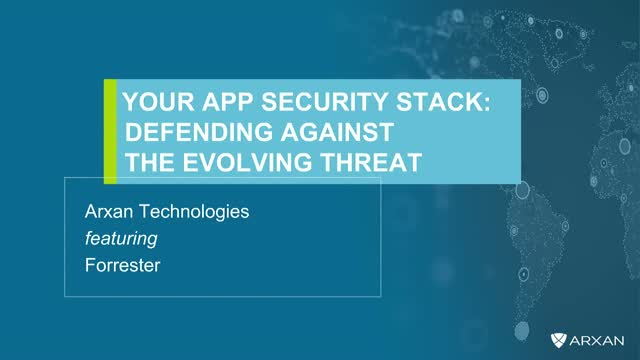 We’ll discuss ways to improve mobile app security, reduce threat response times and minimize the impact of an attack using real-time threat intelligence. Data breaches caused by unprotected applications affected nearly 75% of companies in a recent global survey, yet a majority of these companies admit they don’t adequately invest in app security until after they’ve suffered significant losses. Join Arxan and the Ponemon Institute for part one of our application security insights series, where we’ll share the results of the 2018 Study on Application Security. This survey of nearly 1,400 IT and IT security practitioners from around the world examines the risk unprotected applications pose to businesses, and how companies are addressing those risks. The European Union’s General Data Protection Regulation (GDPR) that goes into effect on 25 May 2018 expands the meaning of personal data, mandates when such data can be collected, and enforces full transparency and consent from the user. Organizations of all types processing data from EU residents must evaluate and likely make changes to their enterprise mobility management practices in order to adhere to the new law or face severe penalties. Watch this webinar to understand what GDPR means for infrastructure and operations professionals that are responsible for mobile and endpoint strategy to make sure your organization is compliant from day one. We review the most important sections of the law related to enterprise mobility from an administration and end user perspective as well as the implications for BYOD programs. Learn how EMM can be leveraged to meet GDPR requirements and how a mobile application management solution like Apperian supports privacy and mitigates risk by managing corporate data while leaving personal data untouched. Watch the 5-minute Apperian App Management demo video today and tour the platform that enables IT and line of business professionals to deliver critical apps to 100% of users across their organization. Watch this on-demand webinar recording to get an inside look at Arxan Technologies' acquisition of Apperian. Maribel Lopez, Principal Analyst at Lopez Research, lead the discussion between Joe Sander, CEO of Arxan, and Mark Lorion, President and General Manager of Apperian, on how the acquisition came about, what it means for the industry and their vision for the Apperian platform and Arxan overall moving forward. An application program interface or API is critical to making mobility work in the enterprise. Mobility has grown in isolation from other aspects of corporate IT infrastructure. It evolved at a different pace, requires a different toolset, and is not yet uniformly adopted throughout organizations. When mobility is isolated and needs to be administered differently, it adds complexity to IT management and does not allow the enterprise to realize the full ROI of mobility. A comprehensive set of APIs is the key that will resolve these pain points and result in an open and extensible enterprise mobility management. Watch this on-demand webinar to learn how enterprises are leveraging app management APIs to extend and integrate the capabilities of mobility management solutions based on their specific business needs. Senior Director of Customer Success, Robert Lacis, and Product Manager, Magnus Mjøsund, provide an overview of Apperian’s API Platform and explore the integration possibilities with enterprise business analytics and intelligence platforms such as Tableau. Mobile applications have become the center of many enterprise transformation initiatives. Customer facing mobile apps handle essential business functions and serve as the face of the enterprise to its customers. Applications are becoming an increased source of risk for the enterprise as they manage sensitive customer information and financial data. Most enterprises believe they have adequately protected themselves against attacks with traditional security precautions. Learn the risks associated with many of these common approaches and what concrete steps an enterprise can take to avoid becoming the next hacking headline. Arxan provides comprehensive app-level security, and enterprise app governance enforcement. Our wide range of patented security capabilities, including dynamic app policy engine, code hardening, obfuscation, white-box cryptography and encryption, and threat analytics help enterprises protect valuable customer, business and IP data.